Australia's Most Awarded Mercedes-Benz Retailer proudly presents this Certified Mercedes-AMG CLA 45 4MATIC Coupe with 2 Years 100% Mercedes-Benz Factory-Backed Warranty & 2 Years Mercedes-Benz Roadside Assistance Applicable Australia-Wide. 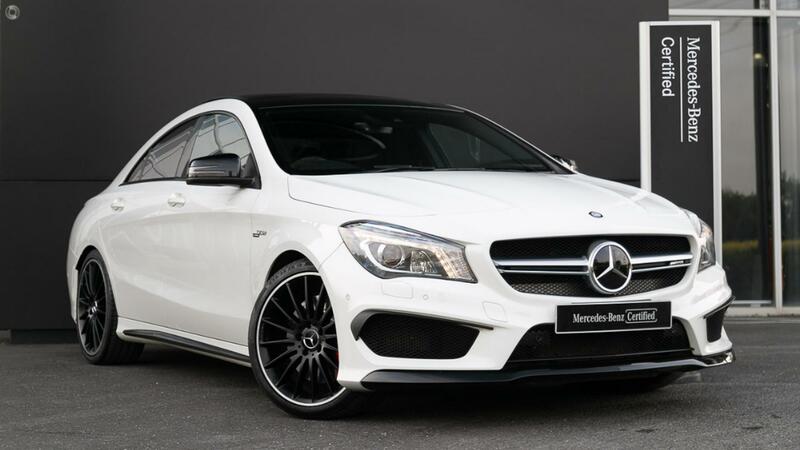 Perfectly presented in crisp Cirrus White with AMG performance seat in Black RED CUT leather upholstery, AMG Carbon-Fibre Trim and riding on Factory-Fitted 19-inch AMG Multi-Spoke Alloy Wheels in Matte Black to complete the prefect specification. Take the wheel of your amazing CLA45 4MATIC Coupe with absolute confidence - ONLY from a Certified Mercedes-AMG expert and the reigning "Mercedes-Benz Metropolitan Retailer of the Year" again, for the 5th time in 6 years! - Seat belts in designo red. - Two-pipe ext system with rectangular tailpipes in polished stainless steel. - TIREFIT with electric pump and pressure loss warning system.